Let batter sit for 15 minutes. Heat up waffle maker. Using a 1/4 cup measure, pour batter into each mold - cook for 4-6 minutes, or until desired consistency. 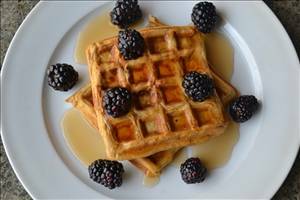 Serve with fresh fruit and pancake syrup. 123 members have added this recipe to their cookbook. Dairy free, protein packed donuts. Pumpkin and oats star in this autumn classic. A delicious dessert or a wonderful breakfast. There are 109 calories in 1 serving of Pumpkin Waffles. Calorie break-down: 8% fat, 75% carbs, 17% protein.